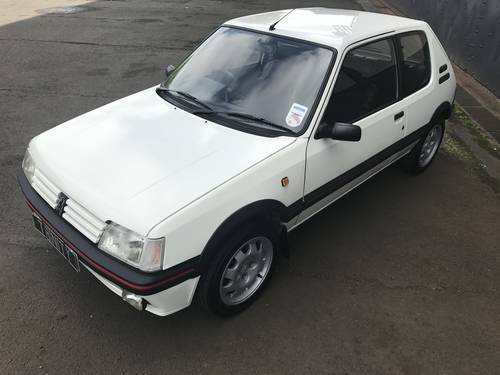 Trinity Car Solutions has pleasure in presenting for sale this stunning Peugeot 205 1.9 GTi in our personal favourite Alpine White, with black leather and fabric sports interior. This lovely little Pug has recently come out of a pruvate collection having been owned by an enthusiast prior to that. 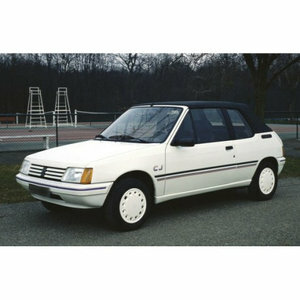 Finished in striking Alpine White with no sunroof, this is a desirable and good looking little car. 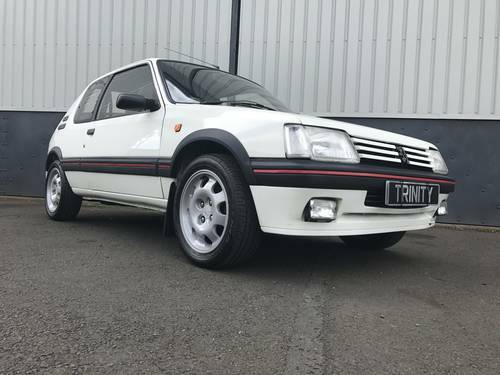 Its paintwork has been well maintained having benifitted from dry storage, and with only the occasional age related blemish is of extremely high quality; this Pug is ready to drive and enjoy. 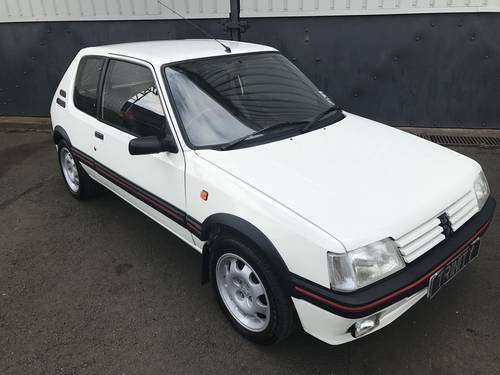 The Peugeot 205 GTi was, and still is, a full-bore, gold medal winning legend. Simple. It doesn’t need contextualising with stuff about how good it was at the time, how far it advanced the concept of small, affordable fast cars, or any of that. Just look at the thing, it’s gorgeous. You can see the design work seeping out of every little corner of its mouthwatering little frame. This is more than a few plastic pieces stuck on to a shopping car, the fundamental shape is stunning. 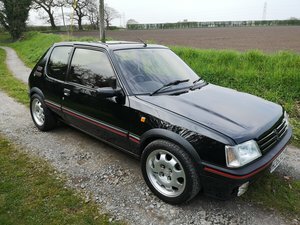 Current motoring press wax lyrical about these little hot hatches, "the best hot hatch ever?"..... probably! 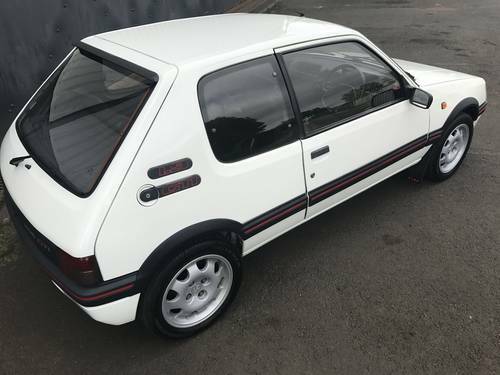 The 205 Gti 1.9 was launched in December 1986 and featured the XU9 1905cc "Bosch L Jetronic" fuel injection engine, fitted with disc brakes all round, half leather and electric windows as standard. This car is the later of the model, with all standard fitments and contrasting grey carpets confirming his later build date. This delightful Pug has low owner numbers and comes with a recent service history showing extensive recommisioning work with bills and invoices, all belts and fluids have been replaced, rear beam overhaul and fully functional. 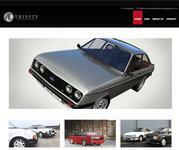 Mechanically excellent, he will come with a full MOT for complete peace of mind. The car sits on "Speed line" alloy wheels with recent matching Bridgestone Tyres, no expense spared in the maintaining of this well sorted Pug. 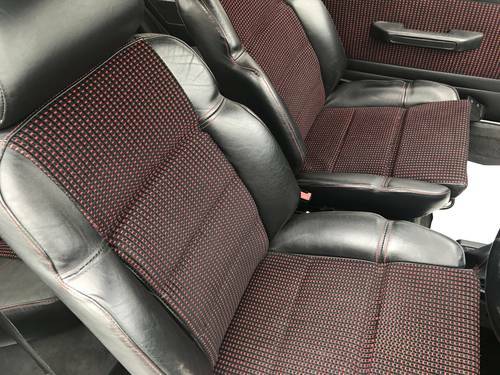 The interior is in excellent condition with the half leather seats in unworn appearance, red material inserts, and contrasting grey carpets. It has a full key set with, biased braking system with braided hoses, the only non standard feature, and additionally a top of the range CD Audio unit. 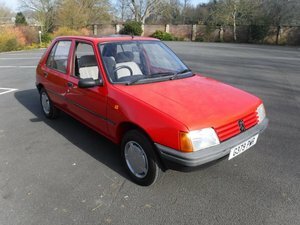 We have marketed a number of 205 GTi's and this is without doubt one of our finest. 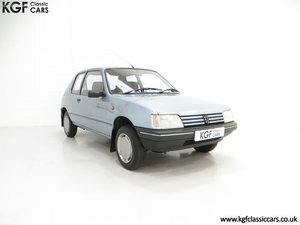 Its previous enthusiast owner lovingly cared for this car and retained and reconditioned its original specification to the most exacting standard. 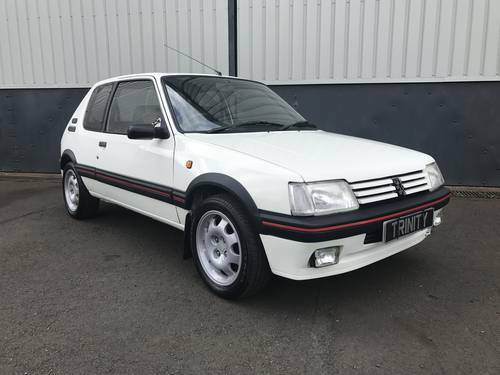 If you are looking for one of the finest, unmolested, original specification 205 GTi's then our example is a definite one for the viewing list. These cars continue to be in demand and well sorted examples in this condition and this colour are becoming very collectable. Any inspection welcome as this car has undergone a complete inspection assessment by the team at Trinity Car Solutions for your peace of mind, and is described accordingly with no hidden issues.